Fall is finally here, which means piles and piles of leaves scattered all around your yard. Fall is finally here, which means piles and piles of leaves scattered all around your yard. 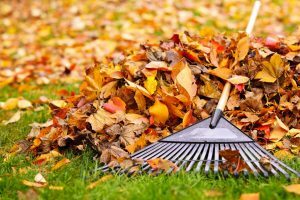 If you are not a fan of fall’s most plentiful outdoor chore, here are some basic tips that you need to know for cleaning up leaves in your yard this fall. The single most efficient way to clear up a large amount of leaves in your yard is with a lawnmower. If you have a mulching lawnmower, you can run it through your yard as you normally would. If you don’t, raise your lawnmower blade to the highest possible setting. As you mow your lawn, the leaves sitting on the surface will be broken down into small bits. The lawnmower will help to push the small pieces into your lawn. Why is this such a good idea? The leaves are organic material that will serve as a fertilizer for your lawn! If you don’t want to leave the leaves on your lawn, you can attach a mower bag to your mower while you work and dump out the extras. Grab a tarp and place it in the portion of your yard where you’ll be starting. Rake leaves onto the tarp and then transport them in batches to the curb, bags, or the compost pile in your yard. If you have a leaf blower, use it on the strongest setting and work in patches to blow the leaves towards their destination (typically the curb or a compost pile). Always start from the part of your yard that is the biggest distance away from the destination to avoid duplicating your efforts. This entry was posted on Friday, October 13th, 2017 at 3:04 pm. Both comments and pings are currently closed.